Gary Barlow is recruiting musicians across the Commonwealth countries who will entertain in honour of the Queen, as part of his Diamond Jubilee plans. While in the Jamaica, Gary met up Bob Marley's widow, Rita. Gary said: "We went across the island recording musicians. Meeting Bob Marley's wife was a privilege." 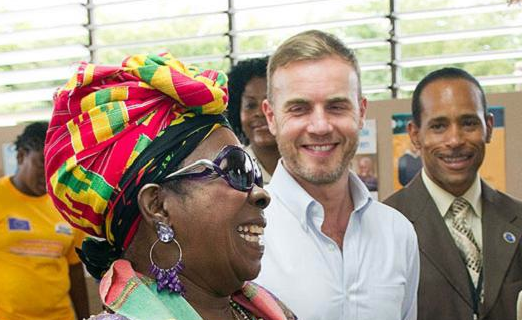 Gary in Jamaica, doing everything the late reggae legend loves - Chilling with Bob Marley's ex, recording music... Wonder if he went green while in the Caribbean?